In history, context is vital. Events seldom make sense when presented individually, and often, the only way to fully understand, comprehend and appreciate any given event in history is to know the chain of events that led to it. Learning about the Second World War is difficult without at least a basic knowledge of the First World War and how that was influenced by the Industrial revolution. Context is vital. Over the weekend, I picked up a book that I've long wanted to read, shown to me by a friend several years ago when it was first translated into English: A Little History of the World. First written and published in 1936 (written in six weeks - SIX), this book covers a staggering amount of history, starting from the very beginnings of human history and culture, from the prehistoric eras, and running up through to the dropping of the atomic bombs in 1945. Needless to say, in 284 pages, this is not a book rife with specific details, names and dates. Rather, this is an extremely broad look at how human history progressed. While there are plenty of details lacking, this book is not intended as a grand work of history. It's written simply, for a younger audience, to tell the tale of our existence - it helps to provide a broad context for our history to anyone who is mildly interested in the subject, and at this, the book succeeds wonderfully. As a student of history, I can appreciate the task at hand, and having read through the book in a day, I was astounded at just how much information is here. Almost every major era of human history is covered, and linked to the next - reading over the pages, we move from the Egyptian dynasties to ancient Babylon, to Greece, to Rome, to the Middle Ages and so on, up through to the present day. Most of the major events in the world are touched upon, but only so much to move the story along from point to point. While there is a high degree to completeness to this volume, there are aspects of history that are not examined, even lightly - the American Civil War is talked about briefly, but only in the context of the role of Slavery (which is really not the right way to examine the war) nor is the European involvements in Africa really looked at, except in the context of the buildup to the First World War. This book is largely a view of the world through Western eyes, and talk from the Americas and Asia aren't really examined as much, which is a disappointment, not out of any sort of nationalistic sense, but to the degree to which some of the major events in US history have played in the world - the Great Depression is not mentioned (although the history here really ends after the end of the First World War), but there is very little about the history of Central and South America or Africa. Reading the preface, it was mentioned that Gombrich intended to expand the book with the translation of an English version that would have talked more about Shakespeare, the Bill of Rights and the English Civil War, but he passed away before he was able to do this. I would have been interested to see how he would have characterized the rest of the 20th century, with the incredible changes and advancements that we have experienced since the end of the Second World War. That being said, this book is a good examination of the world from a very high level - while smaller details are largely not talked about (specific important battles, such as Marathon, Waterloo, etc, are mentioned), the notion of how all these events fit together is the dominant one - specific knowledge of battles is not really necessary at most points, save when they are truly decisive historically, changing the course of nation's histories. In my day of reading the book, I feel that I have a somewhat better understanding about how parts of the world fit together - while I knew most of the details of what had gone on, there were points in history where I was fuzzy on the broad details. This is a book that I wish I had read when I was in middle or high school, because of the broad examination here. An interesting point that I found here was the voice to which Gombrich takes throughout - very light, and while military matters are covered frequently, warfare is never glorified - the preface notes that the publication of the book in Germany was halted because it was deemed too pacifist in Nazi Germany. On an aesthetic level, the book is easy to read - the language is simple, intended for somewhat older children, and is divided into forty short chapters, each with a specific section of history. One of the most interesting parts here is the illustrations at the beginning of each chapter - a simple woodcut that is best representative of the theme or period of the chapter, which is very characteristic of the work here - it adds beauty and a bit of elegance to the pages here. I loved every minute and every page of this book. While this is the broadest possible view of human history, it is done with skill and grace, with an impartial voice throughout, that points out our successes and our flaws as a race, with an incredible amount of wisdom behind it. To best describe this book is an introduction of history, from which any reader would be inspired to find more about any aspect of history that they so wished. I’m now going to make it a point to seek out his second major work, The Story of Art. In the meantime, this will become a treasured addition to my own library of books. 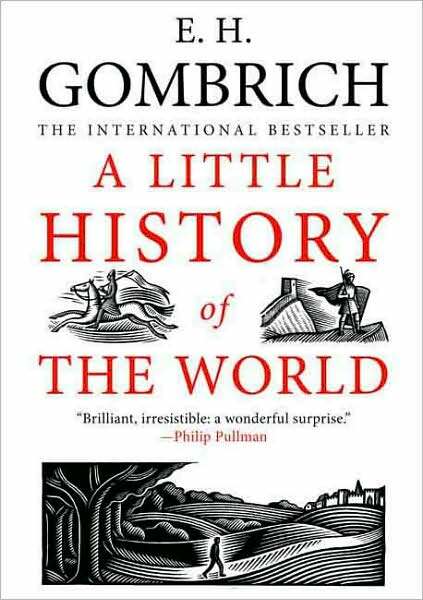 The title of this book can be somewhat misleading - A Simple History of the World might be more accurate, but A History of the World would be the best, because Gombrich has done a nearly impossible task - distilled the world's history into a concise, yet interesting story that is optimistic, critical and inspiring.